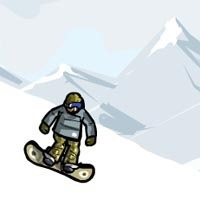 Hit the snow slopes with this adrenaline pumping snowboarding game. Perform crazy stunts on your snowboard to collect points and accolades. Pump air into your stride by timing your jumps carefully while negotiating 3 killer kickers. Slip back for a tail grab, dive for a nose grab, take in the terrain with a 360 flip and then just reverse it with a back flip. Put them all together to collect the mega points. Whatever you do – Have fun! UP ARROW = Back Flip.